A belated farewell to Kitty Carlisle Hart, the patron saint of the New York State Arts Council and an unflappable supporter of the arts and their funding, even during the culture wars of the late eighties. She ended up defending The Kitchen even when we were presenting the likes of of Annie Sprinkle and Karen Finley. She thought they were great. When I finally met her at SFAI when she was receiving an honorary doctorate, I couldn’t resist - I clapped my hand over my eyes and asked “Are you a singer?” (she was a panelist on What’s My Line? for 20 years). If you wish to pay respects you can rent Woody Allen’s Radio Days, where she belts out They’re Either Too Young or Too Old, a single girl’s lament of a man-less America during WWII. Log in to an online discussion with Guerrilla Girls “Frida Kahlo” and “Kathe Kollwitz”, Monday, April 23, at 1:00 PM EST (10:00 AM PST). Breakthrough: An Amateur Photography Revolution, which opened Friday at the San Francisco Art Commission Gallery (SFACG), is a thoroughly engaging show. Don’t go looking for fabulous printswhat you have here are value-added Web search results, nicely produced for the exhibition by Electric Works, but still informal images. What you will see are interesting curatorial approaches. At least eight curators are involved here, and as they sieved the Web they revealed their highly individual minds. The South Gallery showcases JPG Magazine, a smart publication with an editorial cycle that invites readers to post images on certain themes, then moves the pics selected by viewers as the best of the online pool into print. SFACG curator Meg Schiffler and Electric Works’ co-owner Noah Lang looked at 3200JPG Magazine imagestwiceto select the images produced for the exhibition. They preserved a stunning degree of diversity while coming up with photos that relate to each other in offbeat ways. In the North Gallery, six artists and curators dived into the ocean of images posted to Flckr, emerging with image-sets that reflect their individual interests. My favorite was a unpretentious set of squirrels put together by artist Rebeca Bollinger, but every set had something to recommend it. In addition to Bollinger, the curators included Heather Champ, Joseph del Pesco, Chuck Mobley, Renny Pritikin, and Terri Whitlock. In conjunction with the exhibition, a panel discussion “Are We All Photographers Now?,” moderated by Thom Sempere, will be held Thursday, May 31, 6:00 - 7:30 pm, in the Koret Auditorium of the San Francisco Public Library. Panelists include J.D. Beltran, Artist; Caterina Fake, Co- Founder, Flickr; Deanne Fitzmaurice, Photojournalist /Pulitzer Prize recipient, San Francisco Chronicle; and Derek Powazek, Founder/Editor,JPG Magazine. 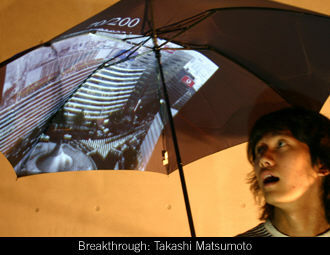 Image: A Flickr interactive artist’s project by Takashi Matsumoto & Sho Hashimoto, on view in the closet gallery of the San Francisco Art Commission Gallery as part of Breakthrough. Among the Guggenheim Fellowship recipients this year are Eastern states artists SoHyun Bae, Rosalyn Bodycomb, Robert Bordo, Chris Lan Hui Chou, Mary Hambleton, Kalup Linzy, Karyn Andrea Olivier, Sarah Oppenheimer, Elaine Spatz-Rabinowitz, James Robert Stewart, Alex Webb, Steven Westfall, and Tommy White. For the complete list of fellows, visit the Guggenheim site. Doris Salcedo is the next artist to take on the Tate London’s huge Turbine Hall. In a series of Unilever commissions, the gallery has hosted spectacular works by Carsten Höller, Anish Kapoor, and Olafur Eliasson. Salcedo’s installment will open October 7, 2007. The old Buzzell Electric building at 130-8th Street (near Mission) is the new home of the erstwhile Trillium Press, which has separated from Trillium Graphics and morphed into Electric Works. And Catharine Clark Gallery has closed the door at 49 Geary Street; it will open again at 150 Minna, ground floor, in May.